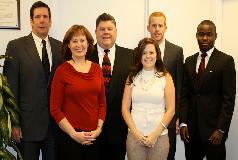 The accounting firm of Marshall & Reumont CPAs welcomes you to our web site! We are a group of highly qualified, experienced certified public accountants. We offer a full range of accounting, tax, and small business consulting services. Marshall & Reumont CPAs will focus on your unique tax and accounting and consulting needs. For expert, affordable service from CPAs that care about you, choose Marshall & Reumont CPAs. Whether you need accounting, tax planning, tax return preparation, personal financial planning, estate and trust, small business consulting, or a full complement of other individualized services, we will give you the full resources you would expect only from a large accounting firm while maintaining the personal touch. On this website, you will find information about our firm, including our list of services. We have also provided you with online resources to assist in the tax process, and financial decision-making. These tools include downloadable tax forms and publications, financial calculators, news and links to other useful sites.